When searching for a family vehicle, you want the best of the best. You want the top safety features, as much entertainment and connectivity technology as you can get your hands on, a reliable performance, and a spacious and versatile interior. And a dash of style doesn’t hurt either, right? Luckily, you can get all of those elements rolled into one affordable package when you climb into the driver’s seat of the 2019 Toyota Sienna. This minivan – otherwise known as the “Swagger Wagon” – is up for grabs NOW at Toyota of Orlando, but interestingly enough, a prototype was recently spotted for the next generation. Check it out! What will the 2021 Toyota Sienna bring to the table? The next generation of the Clermont Toyota Sienna will likely be unveiled in 2021 and from what we can tell, it’s going to be even roomier than it is now (which is pretty impressive considering it can seat up to 8 and still offer an additional 39.1 cubic feet of cargo space). The wheelbase on the prototype model looks both wider and longer, which means a more spacious interior AND a more comfortable drive time. It’s as spacious as it gets – like we said, you can seat up to 8 people with ease. And the interior is so versatile! You can fold seats flat and stow them away to maximize cargo space; you’ll also have the option of comfortable, sliding, reclining captain’s chairs in the second row. It’s decked out with cool tech designed to keep everyone entertained. You can choose from 4 different Entune Audio system, which gives you access to Sirius XM Satellite Radio, Bluetooth streaming, HD Radio, and more. And the backseat passengers can wile away the hours with a dual view Blu-Ray entertainment center and wireless headphones. It’s performance-driven. This Clermont Toyota minivan comes with a 3.5L V6 engine under the hood and manages 296 horsepower and 263 lb-ft of torque. However, in spite of the power you’ll have every time you press the gas pedal, you’ll still save at the pump with 19/27 mpg. It’s super stylish. Just because it’s a family vehicle doesn’t mean it can’t be stylish. 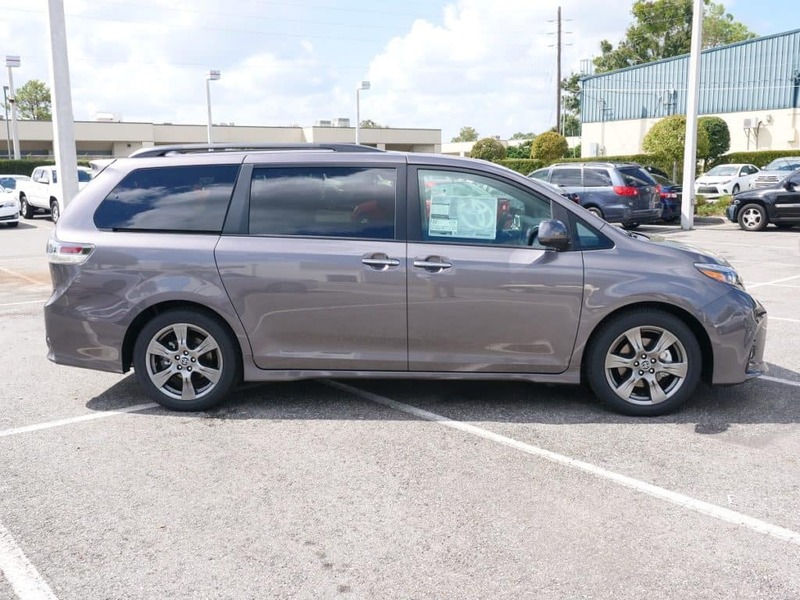 The Clermont Toyota Sienna offers features like HID headlights and integrated fog lights, a rear spoiler, front and rear underbody spoilers and side rocker panels, alloy wheels, and a leather interior… among other things. And the best news? It’s here NOW – you can climb into the driver’s seat for a test drive today. What are you waiting for? Call Toyota of Clermont at (352) 404-7000, or swing by and see us. We’re conveniently located at 16851 State Road 50, just off the Florida Turnpike. 0 comment(s) so far on What will the next generation of the Toyota Sienna offer?